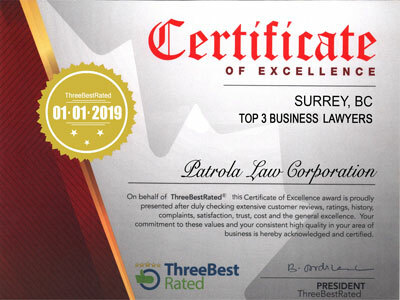 Patrola Law Corporation is a Surrey law firm focused on providing the highest quality of business law services to entrepreneurs and corporations. We work closely with our clients during all stages of growth, from formation to IPO, acquisition and beyond. 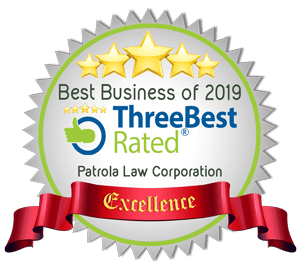 Patrola Law represents clients from across Canada, and around the world, on a comprehensive spectrum of business law matters. We understand entrepreneurs and the challenges of building and running a business in the Internet era. That means providing you with practical, real-world experience, particularly as it relates to intellectual property, securities, and contract matters. We build strong relationships with our clients and conduct ourselves with the utmost honesty and integrity. Your trust is very important to us, and we will deliver consistently exceptional service to you today, and over the years as you grow your business. We Are Not a Big-Box Law Firm. We are not a big-box law firm. An entrepreneur today does not need a cumbersome relationship where the clock is always running and every minute is being billed. Costs are always a concern in business and, to the greatest extent possible, we provide our clients with flat or capped fees, and can facilitate alternative fee arrangements. If it's your first time at Patrola Law, we welcome you to take a virtual tour of our office. Patrola Law aims to create a positive environment which seeks to inspire every startup and entrepreneur growing a business to "be bold" with their vision, from the moment they walk through our doors. We look to empower our clients and remind them that we will be there every step of the way to help them achieve their business goals.